This guide grew out of a book discussion group sponsored by the Honors Program and the David L. Underwood Library at the Florissant Valley Campus of St. Louis Community College. Click on the book cover to open a window that will show copies the STLCC Libraries own for checkout. 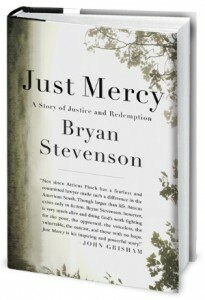 Buy your own personal paperback edition of Just Mercy from the STLCC-Florissant Valley Bookstore and receive a 20% discount. Winner of the Carnegie Medal for Nonfiction | Winner of the NAACP Image Award for Nonfiction | Winner of a Books for a Better Life Award | Finalist for the Los Angeles Book Prize | Finalist for the Kirkus Reviews Prize | An American Library Association Notable Book. 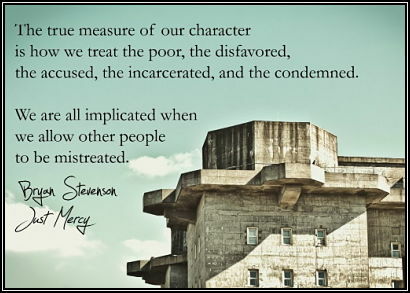 Read more about Just Mercy from the Equal Justice Initiative (EIJ) web site. 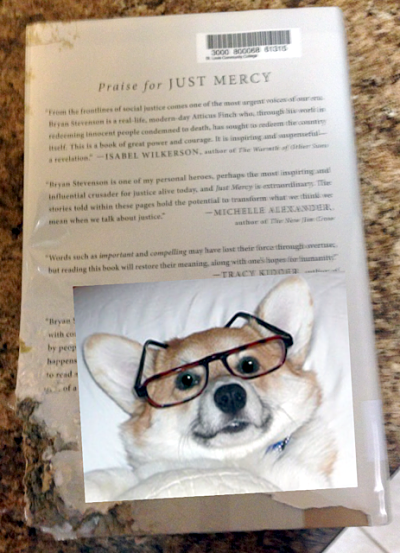 Photo credit: John Furlong's copy of Just Mercy as chewed upon by his beloved dog, Mr. Hudson. Despite the triumphant dismantling of the Jim Crow Laws, the system that once forced African Americans into a segregated second-class citizenship still haunts America, the US criminal justice system still unfairly targets black men and an entire segment of the population is deprived of their basic rights. Outside of prisons, a web of laws and regulations discriminates against these wrongly convicted ex-offenders in voting, housing, employment and education. Alexander here offers an urgent call for justice. Drawing upon broadly representative survey data and qualitative interviews, Children of the Prison Boom describes the devastating effects of America's experiment in mass incarceration for a generation of vulnerable children. Parental imprisonment has transformed from an event affecting only the unluckiest of children - children of parents whose involvement in crime would have been quite serious - to one that is remarkably common, especially for black children. A Lesson Before Dying, is set in a small Cajun community in the late 1940s. Jefferson, a young black man, is an unwitting party to a liquor store shoot out in which three men are killed; the only survivor, he is convicted of murder and sentenced to death. Grant Wiggins, who left his hometown for the university, has returned to the plantation school to teach. As he struggles with his decision whether to stay or escape to another state, his aunt and Jefferson's godmother persuade him to visit Jefferson in his cell and impart his learning and his pride to Jefferson before his death. In the end, the two men forge a bond as they both come to understand the simple heroism of resisting--and defying--the expected. Ernest J. Gaines brings to this novel the same rich sense of place, the same deep understanding of the human psyche, and the same compassion for a people and their struggle that have informed his previous, highly praised works of fiction. "For nearly forty years the United States has been gripped by policies that have placed more than 2.5 million Americans in jails and prisons designed to hold a fraction of that number of inmates. Our prisons are not only vast and overcrowded, they are degrading- relying on racist gangs, lockdowns, and Supermax-style segregation units to maintain a tenuous order. Mass Incarceration on Trial examines a series of landmark decisions about prison conditions- culminating in Brown v. Plata, decided in May 2011 by the U.S. Supreme Court- that has opened an unexpected escape route from this trap of "tough on crime" politics.